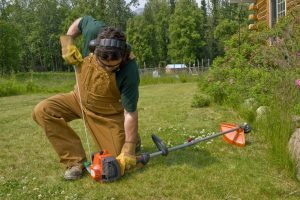 String Eater vs. Weed Eater – What are the Differences? We all know the saying, ‘use the right tool for the right job’ and this should be applied to your lawn. Know exactly which type of tool you should use in order to clear your lawn of any obstacles with no worries at all. Many people are confused with what they are buying. Take for example people buying a string trimmer who would try and use it as an edger in hopes that it would result in a nice and clean edge where the lawn meets the sidewalk. There are many trimmer heads that can always be repositioned to make things more convenient in edging and these can be called a trimmer or edger. 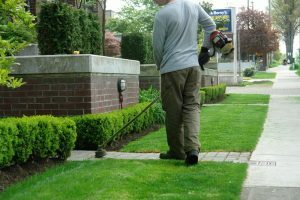 Actually, a string trimmer can also be used in maintaining an edge but it is obvious that an edger would result in a much finer result. String trimmers are great to use when you are trimming around things like walls, posts and other areas in your lawn where the mower just won’t fit the bill. These are items that need a small mower for. If the head of the string trimmer is repositioned, you can also use it as an edger for your lawn. It is recommended that you use a string trimmer every time you mow your lawn in order to create that clean and balanced look. The string trimmer should be use to finish off the areas that the mower can’t get into because they are in the corner. A string eater is really convenient for narrow spaces. Edgers possess a vertical, spinning metal blade that can cut through thick grass and roots. These edgers are bigger in size and are designed to be stable on the ground. They result in a more refined product in edging than gas powered string trimmers. These edgers would result in a nice and clean edge for your lawn. Investing in one would come in handy if you are dedicated to making your lawn as clean as it can be. You should edge your lawn about once a month, provided the soil is dry. 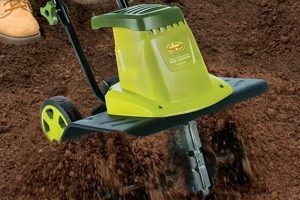 It digs in deeper than a string trimmer and creates a little separation between the lawn and the concrete. Although string trimmers are used for edging, we must admit that it won’t be as good as a dedicated edger. And, a cordless string trimmer is worse than a string trimmer when it comes to edging. This is because a cordless string trimmer possess less power than the electric string trimmer. But, for its use, a cordless string strimmer is recommended because of its convenience. But do remember that a string trimmer will not be as good as a dedicated edger is. A good plug-in or gas powered string trimmer will have more power, but to get a nice clean edge you’ll need a bit of practice and a steady hand. Trimmers are great for what they are meant for: trimming around areas where the lawn mower can’t get to. Edgers do a much better job of what they are meant for: edging. A good gas powered string strimmer is known to have more power than other trimmers of its kind. But be wary, a good plug-in string strimmer needs a steady hand and a sufficient amount of practice for your lawn to achieve a clean edge. Trimmers are great for trimming the edges of your lawn where mowers can’t get into, but never for edging. To emphasize, allow me to repeat that edgers do a whole lot better job for edging than string trimmers because they are dedicated for it. Edgers are primarily designed to cut vertically and are better in keeping rocks and debris from kicking up or avoiding accidentally breaking a window or hitting someone. These edgers can also be used where the lawn meets a hard surface like a driveway. They can cut deep. Deep enough for you to create a trench to run a low voltage landscape lighting. These edgers are a must have if you want a lawn with a neat and balanced appearance. While it might seem unnecessary to have two different tools for yard work, they are necessary to perfect your yard’s beauty. It’s also not really that bad since you don’t have to edge every time and you only have to bring out your edger when you need it. Also, when you are using an edger it can cut through the tough edges faster than your string trimmer could actually get. If you are to choose between a string trimmer and an edger, choose one that is more convenient for you. In the end, the choice is up to you to you use a string edger for an edger or not.